The 14th of November marked the climax of the Coventry Blitz, a series of air raids on the industrial city, and the first real attack by the German Luftwaffe on civilian targets. Whereas earlier raids attempted to distinguish between military and civilian areas, Hitler had decided that this time the whole city was fair game. What followed was the greatest aerial destruction the war had seen up to that point. Sadly, I would have to say that I wasn’t particularly impressed by Coventry. There were some good points: the idea and setting; the descriptions of the bombing and the impassable streets; the scenes which had Harriet and Jeremy attempting to flee the city centre. The scene centring on a man who decided to have a shave in the middle of the bombing was one which worked particularly well. Overall though, I couldn’t help thinking that it was a very slight attempt at a story. There were numerous, clumsy info dumps, particularly in setting up the back stories of Harriet and Maeve, another woman caught in the crossfire. The romance between Harriet and Jeremy wasn’t particularly convincing, even in light of (or because of?) what was happening outside. The ending though was beautiful and poignant, and I think the last couple of sections showed where Humphreys’ strength lies – in description. Both the final scene in the cathedral, and the later scene of reflection on the night of the bombing are wonderfully done. Unfortunately, the novel as a whole doesn’t measure up to the ending. While the book isn’t all I would have wanted, don’t let that put you off visiting the location! As you may know, the old cathedral was partially destroyed by the raid, a new building being constructed across from the ruins of the bombed church. A common joke in Coventry is that what the Germans couldn’t destroy, 1950s city planners managed to finish off, an ironic reflection on the wind-swept concrete wasteland which replaced the bombed-out centre of the city. You've so many good things to say about the book that your review is almost positive. Interesting review and I also enjoyed the post on Coventry. Thanks. I'm sorry it wasn't what you expected. Out of curiosity, what's a typical expression from Coventry? It's strange to read a book about a place you know from infancy; I read one once and was luckier than you, there were local things in it that gave the right tone. Very interesting and thanks for that link. I was startled when I read the thing about Coventry being in the north. I thought she must have meant in the north of London or something equally silly. I think, we have come to very similar conclusions although for different reasons and with a different point of view. You felt it's not about Coventry, I felt it wasn't really about war. She is a stylist, I think, she does write very well, captures little scenes -like the man shaving – in a great way but that's not enough. For once, I would say, this book should have been longer and I hated the coincidence and that love story. Ok, he reminded her of her dead husband but really…. I didn't think it was realistic at all. Still, it's a book I might read again because I liked some of the elements a lot. Now off to that link. Thanks a lot for joining. 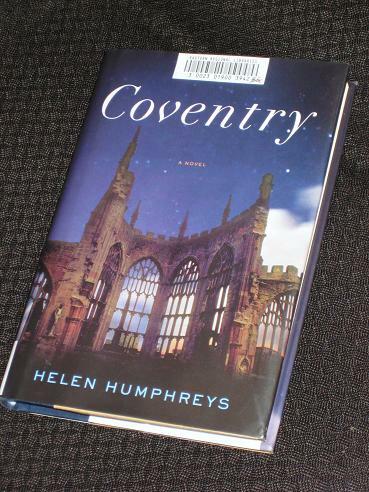 I hope I can include a “proper” Coventry novel in a future readalong. Caroline – Definitely a stylist, not sure she's a novelist… Maybe she'd be better doing short stories? I agree with you that the last few pages were the best of the novel. I don't think she's a bad writer, in fact I found her writing beautiful at times. However, I don't think this subject or story showcased what she can do. There were several awkward scenes, such as the love scene, that just didn't flow. They felt more like filler to me. Maybe you are right, she should concentrate on short stories and not try to push her limits. I should say though, that I haven't read her other novels so maybe I shouldn't pass judgment just yet. As another Coventrian, I had to agree with your views, Tony – the city did not have a strong sense of place – particularly the dry stone walls, which are not found in the Midlands! It is a pity the author did not visit the City. Funnily enough, I have recently read 'To say Nothing of the Dog', which although a humorous time travel book by an American, strangely seems more realistic about the Coventry blitz.